From Gothenburg, Sweden comes another splendid 1/48th scale Hasegawa A6M2 Zero built by Jan "Janne" Sairanen and sent via Stefan Sjöberg. Jan built this model out of the box from kit # 9793 with just the addition of ignition wiring. The model was primed with Alclad primer and the panel lines pre-shaded with flat black. The final coat was a mix of Tamiya XF-49 Khaki and XF-21 Sky in the approximate proportions 6 to 4. Cockpit interior was painted XF-71 Cockpit Green (IJN). The cowling was first painted in Alclad White Aluminium as a base, then given a "salt-chip" treatment before being painted Nato Black. The wheel wells are Lifecolor Aotake. Weathering was kept to a minimum with just some subtle chipping at the wing root and some oil paint streaking. Thanks to Stefan Sjöberg and Jan for kindly contributing these images. 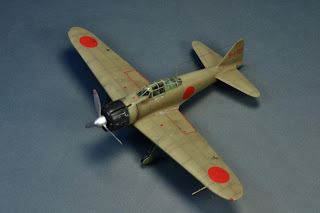 Lots of excellent Japanese aircraft models appear on well-known forum pages and "disappear" after a few days and a few plaudits. 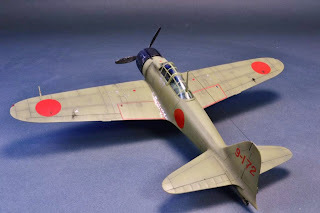 I'd like to appeal to those who enjoy reading this blog to consider contributing images of their Japanese aircraft models here too and to encourage others to do the same, thanks. If you could include a few words about the kits and the builds, the paints chosen, etc., then that would be great. Image credits: Model images © 2011 by Jan Sairanen via Stefan Sjöberg. Great work on the Zero, "Janne". Just as sweet as your A6M3! Always love your work!